Picture this: your company builds a web application. The product turns out well, and your team is happy. But one day, it doesn’t work. No one on your team uses it, so no one notices until you start getting chats and emails from angry customers. However, your customer support team has no idea what happened, so they scramble to work with IT and find the source. Meanwhile, your customers are growing more upset. A competitor’s similar application is a few clicks away. Reduce lost revenue. As mentioned, consumers are fickle. According to research, customers will only put up with slow apps for about 60 seconds before heading elsewhere. With so much competition out there, it’s easy for your customers to find another product the second yours stops working. Let’s say you operate an e-commerce store. Even the smallest slowdown can lead to abandoned shopping carts. By monitoring your program, you can find out when the site is not performing as it should, giving you time to fix the problem before it truly becomes an issue. Reduce other risks. In some industries, disruptions mean more than lost revenue. You might face regulatory fines. Your brand’s reputation takes a hit. Lost productivity. If your app breaks, your customer support team will be inundated. Your IT team will divert its attention from current projects to focus all energy (rightly so) on fixing this problem. All this means more lost revenue and time. Generate app improvements. Proactive management of your app means your team can take advantage of opportunities, think ahead about making it better, adding features for customers, or take advantage of changes. Monitoring your applications is easier said than done. Without a process in place, something will be ignored. Here are the three best practices for making sure your apps are getting regular checkups. Use an APM. APM software can alert you to issues before they can delays. Read below for a list of potential tools. Use the app. While tools are fantastic, part of your team should be keeping an eye on your app as well. The IT department can set up a schedule to log into the app each day as a regular user and make sure everything is working. Yes, this takes effort and takes him/her away from other responsibilities. But again, if it breaks, your IT team will know about it much faster and can start fixing it — before you get angry chats from customers. Create a disaster plan for problems. What if the worst happens? What about a small problem? Make sure you have outlined the steps for your team to follow when something goes wrong. 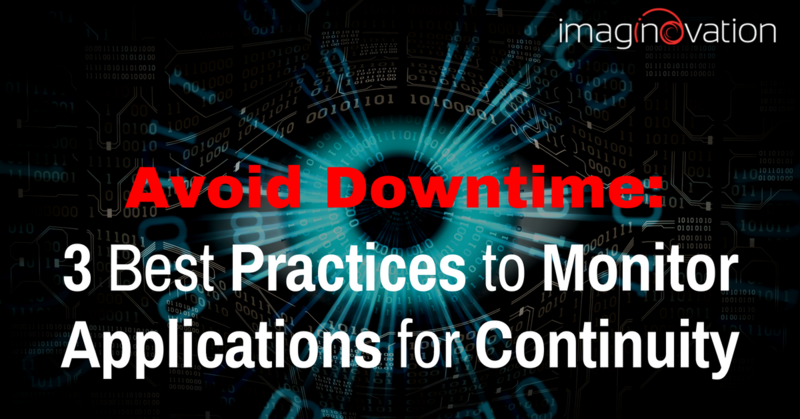 Map out your recovery time objective (RTO), the maximum period your application can be offline. You also must know your recovery point objective (RPO), or the maximum acceptable length of time during which data might be lost from your application due to a significant incident. ● Alert you to any failures. ● Tell you if things are operating more slowly than usual. ● Identify the cause of the failure or slowdown. ● Measure the performance of every request. ● Maintain logs that you can access. ● Performance analytics at the code level. ● User experience analytics – For example, how are users engaging with the app? What about those using a touchscreen? ● Insights about improving the user experience. ● Intelligent alerting – The ability to discern which data is relevant and which is not. ● Change analytics – Alerting your team to how code changes affected the app. ● Use by technical and non-technical members of your team. ● The ability to manage custom analytics created by your team. As you spend time and money building a mobile or web application, be sure to protect your investment by thinking ahead about monitoring it. Talk to us about your next app project.